Xylem's Wedeco Duron is a 45-degree, vertically-inclined, open-channel UV system possessing an integrated, compact, automatic-lifting device and featuring energy-efficient, high-power Ecoray lamps. The Duron system is designed for new plant installations or retrofits into existing chlorine contact channels and provides ideal disinfection for mid-size to large wastewater treatment plants. The enhanced Ecoray 600 W lamps, together with the new lamp orientation, reduce the required lamp count by more than 50% versus conventional low-pressure, amalgam UV lamps. The reduced lamp count is balanced with the 4.6 feet (1.4 meter) lamp length that is easy for operators to handle. Additionally, reduced channel depth requirements lower the building costs, while a small footprint is maintained thanks to the compact inclined design. Variable bank sizes and outstanding flexibility in bank quantities make the Duron UV system the best choice to fit your requirements. Upgrade options allow you to design a system that you can easily adapt to acommodate either higher flow rates or new regulations in the future by adding additional UV banks. Xylem can help you custom design your system for the exact number of lamps you need in the layout that works best for your plant. The Duron UV system not only results in lower capital costs, but lower energy consumption as well. OptiDose, the sensor-based, real-time dose control, monitors operating conditions including flow, UV transmittance (UVT), and UV intensity. 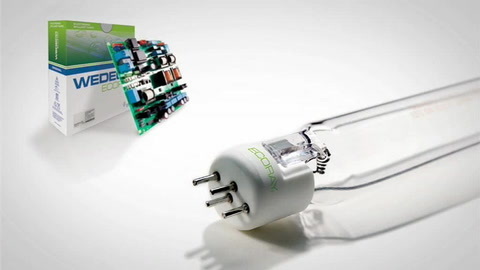 Then, with proven control logic, OptiDose adjusts the energy consumption to the minimum needed to meet dosing requirements so that the right dose is delivered using the minimum amount of energy. The Duron's Ecoray lamp and ballast technology gives higher relative UVC output than conventional low-pressure, amalgam UV lamps when operated in dimmed mode. Energy is saved by automatically dimming the lamps to match the dosage needed. The Ecoray 600 W lamp also has higher energy efficiency than more powerful lamps, further reducing energy costs. Optimized hydraulics ensure superior dosage distribution for more effective disinfection with reduced energy consumption. This has been proven by extensive 3rd party validation tests. Xylem's Wedeco Duron UV system has been validated with multiple challenge organisms, at varying flows and a wide range of UVT. The Duron UV system’s validation envelope is one of the largest in the industry, ensuring the performance needed to meet plant conditions and treatment objectives, and delivering the highest water quality. With the Duron's validated dose design, the design can be fine-tuned to match water quality, operating conditions and discharge requirements. This design approach ensures that the system design is neither oversized nor under sized. Optimizing for specific site requirements gives the smallest possible UV system without compromising performance, ultimately saving upfront capital costs and operational costs for the life of the system. Central to the design is how easily and efficiently the Duron UV system is maintained and serviced. Easy lamp replacement can be conducted while the modules remain in the channel. Dry-top UV lamp access and the compact, integrated, lifting mechanism allow unsurpassed safety and ergonomic maintenance. Each module can be lifted individually for any necessary maintenance at a comfortable service height. The lifting system is also designed at a 45 degree angle, maintaining its small footprint. Cleaning is simple and safe thanks to the Duron's automatic, chemical-free wiper system. Wipers consist of a unique ring and brush design, proven effective even in waters with high fouling potential. Although some maintenance, such as wiper ring or sensor replacement, requires lifting the module, the unique automatic mechanism will lift an individual module, while other banks of modules remain in service. Operator access is quick and easy, requiring no crane or additional floor space. The result is continuous treatment even during maintenance. For seasonal operations, modules can be lifted out of the channel and left in the raised position, saving storage space. The Duron's electrical components are located out of the water and are easily accessible. Ballast cards are separated from UV lamp modules for easy maintenance and operational stability. Cabinets are rated for both indoor and outdoor service, providing added flexibility in constructing or retrofitting the plant.